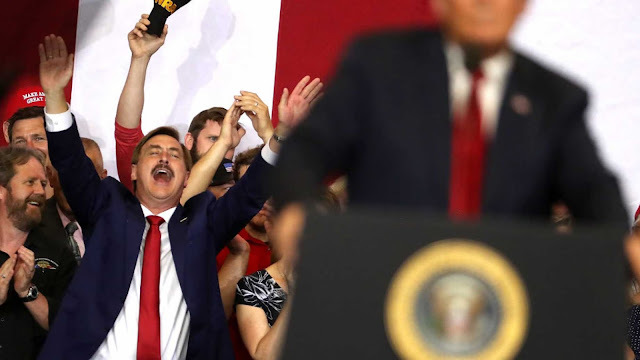 Michael Lindell, a former cocaine addict who amassed a $300 million fortune selling a pillow, has dropped $1 million into a new movie from the makers of "God's Not Dead." "I don't get into things for the money; I get into them if the message is right," Lindell, a supporter of President Trump who invented "My Pillow," told The Hollywood Reporter. Lindell invested the $1 million into "Unplanned," a movie shot in secret because it gets behind the scenes inside Planned Parenthood, the Reporter said. His investment amounts to one-sixth the entire production budget of Unplanned, which comes from some of the same filmmakers who were behind God's Not Dead and I Can Only Imagine, a couple of Christian films that did well at the box office, earning $61 million and $84 million, respectively. Lindell also has a cameo in Unplanned that's sure to raise eyebrows in certain circles, as he is seen bulldozing a Planned Parenthood site to make way for the headquarters of an anti-abortion group called 40 Days for Life. "I'm pro-life and I'm happy to do it," Lindell says. Unplanned is the second movie Lindell helped fund, the first being Church People, a Christian comedy starring Stephen Baldwin that is in postproduction. Lindell has a cameo in that film as well. "It was difficult. I have a spirit of unworthiness so I had to get over my shyness," he says. Lindell took heat when he refused to pull his ads from Laura Ingraham's show on Fox News after she made controversial statements about the student leader of an anti-gun movement. "I did not take my advertising down from @IngrahamAngle and @FoxNews, nor do I intend to," he wrote on Twitter in April. "When they tell me to back down, I double down, and my sales go up," Lindell told the Hollywood Reporter.